Children are just naturally inquisitive and at the beach they are bound to continuously run up to you with a new treasure in hand. Mom, look what I found! I always had a bucket ready to hold the shells, broken and whole, that my children had discovered while digging moats and building castles in the sand. Children have an innocent and unique way of looking at everything. They don’t bypass the ordinary as we adults might do, because everything to them is extraordinary. Imagine a world where everything is new! If it were up to me to walk the shore and search for shells, I would step right over a simple clam shell or cockle shell in search of a spiral beauty, but the ordinary shells always fascinated the kids in some way. “Look, Mom, this one has …” and it could have a strip of color or a another shell stuck to it – whatever they thought was worthy of collecting. And it wasn’t only shells we brought home. Horseshoe crabs, crab skeletons and claws were awesome finds. 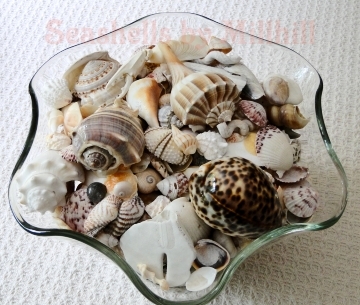 Back in those days, when we spent many weekday mornings with friends (or without) at Bethune or New Smyrna Beach I didn’t know anything about seashells, so I had nothing to teach the kids. I’d say, “oh wow, that’s a beauty and add it to the bucket without another thought.” Actually I was thinking, what am I going to do with all these shells at home. We already had buckets of them! Shell collecting can be a time of teaching the kids too, but only if you have the knowledge yourself. One basic thing you can teach a child of almost any age is that seashells come either in one piece and are called gastropods, or they are made in two sections, such as clams, and are bivalves. Most of the shells we found on the beaches of the east coast of Florida were the latter, half of a cockle shell. It’s just a fun way to teach while at play, which is the best way to learn.